How can I accurately describe how excited I was in the summer of 2008 to see WALL-E? The fact that I ducked out of a friend’s wedding early to catch a matinee of WALL-E with my siblings is an understatement. All I knew was that it was the latest Pixar film, directed by Andrew Stanton (so I knew it was in good hands), starring an adorable little robot made me squeal with happiness at every commercial and image leading to the film’s release. What I experienced in the theater, and every time I watch it now, is much more thoughtful, emotional and fun than I ever could have imagined. WALL-E is a lonely little robot on Earth, about eight hundred years in the future. His main purpose, or directive, is to scoop up trash humans left behind, compact it into cubes and stack it neatly. From the towers of trash cubes blending in with skyscrapers, he and other WALL-Es have been very productive, but the job is not done. And Earth is a barren wasteland, full of piles of junk. The humans have all left, on a sort of space cruise, and plan to come back when Earth is habitable again. When WALL-E sees a new robot, EVE, brought to Earth, his day-dreamy, romantic hard drive is immediately in love and he is set on an adventure that blasts him into space and could bring the humans back to Earth. What makes WALL-E different from most other animated films, is that it runs almost like a silent film. Hardly any dialogue is spoken for the first half of the film, but I don’t think many people, including children, will be bothered by it. We watch WALL-E go about his day to tunes from his favorite movie, Hello Dolly. It’s so fun to watch him happily discover fun objects (a fire extinguisher and bra are especially cute moments), and have a pet relationship with a roach. With EVE have an added element, but still the communication is kept to a minimum: “Directive? Classified.” Whether it’s Tarzan, aliens or robots, some communication comes natural. Thing is, these images of WALL-E have so much heart to them. He is such a loveable clutz, his grocery cart incident always gets me laughing. While he can be cute and dopey, he’s also so sincere and sweet. And the way he is always striking out with EVE keeps us rooting for him. Not since R2D2 has a robot with such a limited vocabulary stolen our hearts. 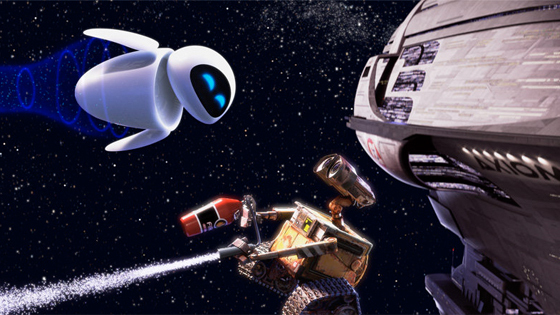 Compared to most animated films, WALL-E was nominated for quite a few Oscars. While it was nominated for best original song, original score, sound editing, sound mixing and original screenplay, it only won for Best Animated Feature. That is still quite an honor, and letting a few awards go to Slumdog Millionaire is nothing for a little robot to be ashamed of. If 2008 had gone with ten Best Picture nominees, rather than five, WALL-E would probably have secured that nomination as well. 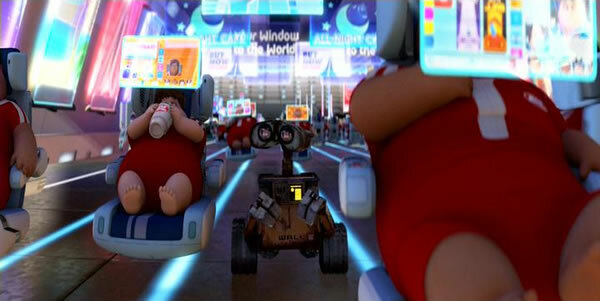 At the root of WALL-E is an environmental message about changing the way many of us live now. It’s sad to see the humans evolved to fat creatures that only interact through screens and laze around in hover-chairs. The Earth reduced to a dry, dust storm planet surrounded by useless satellites can be startling. And there is too much trust in robots, some of them with their own sinister agendas. Without preaching or scaring the youngest viewers, the idea that we need to take care of the Earth, and ourselves, is strong and serious. Make sure to watch the ending credits, I really love the way Earth and humanity’s rejuvenation is depicted through the evolution of art.